The mind creates the chasm which only the heart can cross. A disciple lived for a time with Zen master Kassan. But feeling that the teachings did not suit him, the disciple decided to go on a pilgrimage. But everywhere he went, the disciple only heard praise for how Master Kassan was the best of teachers. Finally the disciple returned, and when he greeted his old master he said, "Why did you not reveal your profound understanding of the dharma?" The Master smiled, and replied: "When you cooked rice, did I not light the fire? When you served food, did I not hold out my bowl? How have I failed you?" At this the disciple was enlightened. When someone creates a work of art that seemingly captures, describes, celebrates your life at the moment, you get spoiled. You think you must have a personal connection with this artist, that somehow you are universal and famous: an archetype, a microcosm, a herald. You develop expectations of the artist...and if the next piece doesn't continue the synchronicity, you're disappointed and maybe resentful. Perhaps you dismiss the artist as having dimmed and missed the boat. Washed up, a has-been. Everyone knows, and especially today's teen-agers, this kind of thing used to happen a lot in the rock music of the 1970s. Few singer-songwriters did it to us more than Joni Mitchell...and few suffered our disdain for her later efforts more than she. Joni didn't seem to need our illusions and fantasies about her as much as other performers though. Probably when you grow up in Saskatchewan, you're accustomed to the richness of solitude...and there's always something else to do. People cruelly have responded to Ms. Mitchell's solitary ways by calling her "reclusive," which really isn't true at all. She always is creating and her art is for others, as well as an expression for herself. New music and paintings have been around if you cared to look for them. But suddenly now once again, Joni Mitchell seems to be everywhere. A big feature article in yesterday's New York Times, a gallery showing in LA last month, an award ceremony in Toronto last week (where the decorating photo of her was taken), choreographies for ballet companies, and a new album of songs in the wings. Alas, she still smokes. I asked her to replay me the song a few times. It is one of the most haunting melodies she has ever written. There was an electronic blight as she drove me back to my hotel at 5 a.m. in her Lexus, with her Jack Russell terrier, Coco, perched on her lap. The block had lost its electricity, as if on cue after a night of dire ecological warnings. Over the course of a dozen or so hours of a wide-ranging conversation, she gets to talking about how her new interdisciplinary project began: with a curious letter she received last year from one Jean Grande-Maître. “Please forgive my somewhat imperfect English as I am a native of Quebec and I am still brushing up on this new language,” it read. “Next year will be Alberta Ballet’s 40th Anniversary Season and as Artistic Director, I would be enthused by the possibility of choreographing a ballet to your brilliant and profoundly moving music. “Everything centered around this blonde, blue-eyed ballerina from Australia, and it was sort of dancing my life,” Ms. Mitchell recalled. “But I thought, that’s not important right now.” Anyway, she had a better idea. Ms. Mitchell was stunned. “How did he know that?” she wondered. “That’s an amazing thing for anyone to know at any age. The line just stuck.” When the war in Iraq began, her grandson’s words resonated in her mind, and she “gave birth,” as she described it, to four new pieces. That “short moment” he had requested turned into one of her inimitable all-nighters. And in the end the artistic director of the Alberta Ballet got more than he hoped for. Not only did Ms. Mitchell agree to the project, she took it over. She is of course well past the stage of having to prove herself artistically. She is in possession of one of the most extraordinary song catalogs of the past half-century. Her chords break harmonic rules, have no technical names and defy Western musical theory. Her voice is an instrument that has grown sublimely heavier and huskier over the decades. But she could not help being what she calls a “pot-stirrer.” She thought about how the Maya calendar ends in 2012, about the 2004 tsunami and Hurricane Katrina. What, she wondered, what do you write at the end of the world? “The Fiddle and the Drum” features two of her new songs: “If,” based on the Rudyard Kipling poem about war and stoicism (“Just about my favorite poem,” she says), and “If I Had a Heart, I’d Cry,” criticizing what she calls the current “holy war.” The rest of the ballet, named for a 1970 antiwar ballad from her second album, “Clouds,” is dominated by material from her ’80s and ’90s albums, which are more rhythmically charged (and hence better for dance) than her earlier work. The backdrop is composed of stills from Ms. Mitchell’s mixed-media art exhibition. One night while she was flipping through “The Gold Diggers of 1937,” CNN and the History Channel on her ancient television (she is something of a Luddite and only recently got a decent stereo system), her screen went on the fritz, blurring images and turning everything a radioactive emerald. Faces melted away, and lines of bodies seeped into the frightening indistinctness of nightmare, as though the malfunctioning television were offering a metaphorical political commentary. She could no longer tell soldier from chorus girl, battle casualty from lover, the dancer from the dance. With 9 songs and 27 dancers, the result is equal parts Busby Berkeley spectacle, political jeremiad and rock opera, a collection of songs that form an essay on war and incipient environmental apocalypse. Young, athletic bodies are sent off to kill and die. The earth is electronically set for destruction. Dire biblical prophecies and the grave warnings of Indian chiefs ring true. But Mr. Grand-Maître wanted to avoid the literalism that marred Twyla Tharp’s recent Bob Dylan musical, choreographed as it was with jugglers and clowns who came down to do tricks for you. (“Dylan’s not a dancer,” Ms. Mitchell added. “I am.”) So when she sings the line “In some office sits a poet,” the choreographer was quick to say, we will not actually see a poet sitting in an office. The approach is more abstract — allegorical but not obvious. During “If” Kipling’s verse is staged as a street scene, a place where young people prefer dancing to warring, and where hip-hop, modern dance, ballet and jazz collide. Mr. Grand-Maître compares it to a Mardi Gras carnival. “Hold on,” Ms. Mitchell sings in the song’s refrain, but the dancers are going wild. Mr. Grand-Maître said, “What she’s saying in the song is to hold on to that life and that flow.” He and Ms. Mitchell met twice in Los Angeles and talked on the phone a dozen times. But while she will be on hand for the last week of rehearsals (and will film them for a documentary she’s making), she was not directly involved in the dance itself. Once you get past the security gates, Ms. Mitchell’s house feels like a pocket of middle-class comfort in the midst of zillionaire Beverly Hills. In some ways life is still as it was in 1974, when she bought the house: She has no computer, no voice mail, no cellphone and no e-mail. At one point, when we tried to remember one of her lyrics, we scrolled through my iPod. She said it was the first time she had listened to one. As she played some tracks from her new album, she was still adding and subtracting, wincing at lines that struck her as too sentimental. “Listen to this song,” she insisted at one point. But she wouldn’t really let me, or I couldn’t sufficiently take it in. Her conversation competed with her music, and I was getting double Joni. Talking about the ballet turned into a kind of circle game. The dance was about the war, and the war led her to write, which in turn meant talking about what makes her write in the first place. There was simply too much to express. She continued into the wee hours of the night, musing about her relationship with the daughter she gave up for adoption in 1964 but with whom she was happily reunited 10 years ago, and about the shift from personal writing to her broader ecological-political-theological ruminations. On “If I Had a Heart, I’d Cry,” one of the songs she used in the ballet, she sings, “Holy earth/How can we heal you/We cover you like blight/Strange Birds of Appetite/If I had a heart/I’d cry.” I asked her to replay me the song a few times. It is one of the most haunting melodies she has ever written. David Yaffe is assistant professor of English at Syracuse University and the author of “Fascinating Rhythm: Reading Jazz in American Writing” (Princeton). thanks, jazz. This hits the spot. 13 Feb 2007 @ 19:19 by celestial : This is how they think! What? You have voted a war with such rapidity and such indifference? Oh! It is a war war of no importance, it will cost only eight million dollars. Vax. Those lines, wherever they're from. And whoever wrote that, speaking of the dark, must have known many millions of us can share that same deep anguish. I remember my father staring sadly at me when I was little knowing I would have to lose some very basic illusions regarding life when I fully faced life and grew up. That sentiment, the one you quote above, is not that unusual. Have we, humanity, been given the unusual gift of being allowed to observe ourselves as we destroy ourselves? What a paradox! For if we truly are destroying our environment we can watch ourselves do it. Frankly, I think we should assume we are. What right have we, anyway, to so befoul our nest? The words are Joni Mitchell's, Paul, found at the end of the interview in the first comment of the thread. "....Joni didn't seem to need our illusions and fantasies about her as much as other performers though. ...."
She must be a strong person to be thus and still smoke too! Maybe she enjoys a non polluted air area, and maybe she avoids the other 5 cardinal mistakes against the physique to compensate for the smoking. Some people are advised to smoke Ayurvedically, it is a way of getting movement into a traditionally settled place in the body, so maybe she is doing the right thing for her constitution! Will return to read more leisurely. Thank you J.
I guess learning these things is growing up. As a kid I somehow believed all true barbaric human devilishness existed in the past. That civilization had advanced us out of truly vile behavior. And that when it happened it happened in other, backward nations. Not, with the exception of the South, in the United States. I suppose there are people who think that way here in the United States. Or else how is it possible for them to so easily believe Muslims and Arabs are evil? Swallowing such nonsense as "if we don't fight them there we will have to fight them here." Or that we are in "a war of civilizations," up against Islamo Fascism and have to stay in Iraq. I've heard plenty of Republican Congressmen claim all this in the House "debate" which has proceeded for the past three days on the war. Nothing at all there to be embarrassed about Quinty san. One thing most Americans don't realize or don't want to is that the Government of this country was taken over lock stock and barrel in 1933 but the takeover was instantiated just prior to the check mate move at Jekylls' Island. The Jekyll Island accord. The death knell was heard after 1933 when all Americans were enslaved via the ingenious system of commerce then put in place. There is no Constitution, the UCC is the 'Law of the land,' the nation is broke, everyone is a debt slave who 'buys' into that system (The way out of it is through it!). That's the Tally and we know names and numbers. Indeed it is a war of civilizations...at least 'three.' Judeo-whatever, Islamo-Johnney come latelys, and Christiano-cretins... all three from a rumored source somwhere "over there" in the general sort of Baghdad, Iraquish, region. it is a war of civilizations...at least 'three.' Judeo-whatever, Islamo-Johnney come latelys, and Christiano-cretins... "
17 Feb 2007 @ 12:35 by jazzolog : You Mean This Guy's Not Our Great Hope? 17 Feb 2007 @ 18:04 by vaxen : Hahahahaha! Good one jazzo! He is being used, but he knows that. I mean, after all is said and done, isn't there a ''black'' pres in the made for TV mindwash called "24?" 24 hours, 24 little hours, that go on forever just to get ''the dagger'' across! Hip, hip! Hip, hip! Hip, hop! Who be dat Ray? As one far rightwinger said Oboma is an unknown, which is why he appeals to many Democrats. Not knowing much about him those Demos can pin their hopes and desires on the man. (As the cartoon demonstrates.) I do know that he was far more progressive when he ran for the Senate, and instantly dropped all that energy once he got in. Though he opposed the war from the beginning, which speaks well of him. Since he must have been thinking of running for the Senate at the time. Another thing I agree with the Repubs on is that the Iraq Study Group findings should have also been put up for a vote in the recent House vote on the war. The Repubs begged the House Rules Committee the night before to include such a vote. But the Dems having a nine to four majority in the committee shot the idea down. Had they included this vote and the possibility to debate ammendments the House vote would have been considerably more bipartisan. And this could have been more of a step forward. Now why would the Demos so limit the debate? Since the point is that some sort of withdrawal needs to be started and it would make sense to bring many more Republicans on board. Yes, the Baker Hamilton plan has its faults, but at least it's a start. It calls for negotiations which several Republicans favor. And it would have given the Congress a loud bipartisan voice to finally begin to impress upon the president that we need to change course and withdraw. Politics is a nasty racket. Okay Vax, sock it to me. When we naifs need our diapers changed I always know who to go to. And who to ask. I look forward to your consoling words. Richard, enjoying your immense, voluminous, & beautifully written blog---one of the best on the web. This fund the troops resolution the Republicans have put up in both the House and Senate is a poison pill. Their language argues that to cut off funding for the war would be to leave the troops out there in their desert foxholes with no weapons or arms. So they, the pro war Repubs, cling to a somewhat primitive "support the troops" stance. That increased funding and moral support is only the way to go. The Demos have squelched that approach, not desiring to be seen as putting the troops in harms way. Desiring to avoid being tarred. So they simply removed the amendment from the floor. The jingo tone of "support the troops" has made many a (nearly) honorable member of the House or Senate laboriously explain that he or she truly does love the troops, and would never do anything to ever harm them, ad infinitim. As if anyone in either the Senate or House ever would. (With the exception of Vets benefits and whatever benefits Halliburton.) But the more moronic Repubs have conflated continuing the war with supporting the troops. And their more moronic constituents support this airy notion. After all, we don't want to have to "fight them here." As it is, the argument for "supporting the troops" means endless war. A foolish argument which is not that difficult to expose. But, instead, the Demos appear to want to rigidly control the votes on the floor, making themselves appear as if they are quashing dissent. And, alas, they are. in case she visits our humble site, this thread is not discussing her intricate chordal structures, but instead rages about the Power Elite and the precipice over which they've shoved the rest of the world. Scrooge's words live on: "If they'd (the poor) rather die (than submit to the treadmill and Poor Laws of 19th century London) they'd better do it, and decrease the surplus population!" I continue somewhat amused by Congressional debate that at this point, as far as I've been able to research, doesn't realize Bush already has moved troops around to secure his family and friends' oilfields. A month ago France24 showed a video of troops on the move from neighboring countries to Iraq. See it yourself http://www.newciv.org/mem/persnewslog.php?did=63&vid=63&xmode=show_article&artid=000063-000414&amode=standard&aoffset=0&time=1195386370 at the first link in the second comment, titled "What One Soldier Can Do." Besides that, the Associated Press reported Friday another deployment of 1000 was shipped out three months early from over here. http://www.chron.com/disp/story.mpl/ap/politics/4559808.html It's the Congress that's naive to think a man like Bush ever has done anything that anyone told him to do. I would say this to Vax though about the mindwash stuff. I'm a theater guy and may be more aware than most of what power the stage has in its various manifestations and rituals. In the classical Athens of Sophocles, the whole place shut down for a week each year and everyone went to see plays, but that's all the theatre they got. Today in the States there are 500 TV channels of drama available 24 hours of every day! Of course it's even more absurd than the 2 miles of aisles in every supermarket devoted to selling breakfast cereals. But that doesn't make either the performing arts or corn flakes wrong. What's wrong, as you surely agree, is the horrible appetite we've developed and the marketeers who pour the money into galvanizing the addictions. The sneer of greed will be remembered as the certain symptom this great country has lost its way. Let me say finally that if Steve Mowrey has managed to Google me down---and who knows why?---I may have to pack my bags and get out of town. Steve and I used to live on the same street some years back here in Athens, Ohio, and were known to carouse regularly---sometimes around great fires in his back yard, and always near turntables bellowing out honking saxophones. He has a wonderful history in these parts of encouraging writing on the published page...but I'll have to return the Google to see if he now corrupts the Internet. I'm flattered of course that he's spent some time at jazzoLOG. Bush and his crowd seem to be the apatheosis of greed. A culmination of the corporate spirit. Is Bush confused about his role? Probably not in his own mind. For, judging by his body language and mannerisms, he seems to see himself as a Commander in Chief AND CEO. Which is not exactly like a president. Have any other pres's gone about saluting EVERYBODY besides those in uniform? He even seems to have a taste for military uniforms. This seems reminiscent of former leaders elsewhere who had a thing for corporations and military uniforms, which doesn't seem to bother Bush. Or does he even know? Free enterprise - a worldview which has deep roots here in America, as it does elsewhere. Business, the family, religion: no politician will tread on any of these things. And what with the triumph of the corporate spirit here (temporary?) those with a milder vision, the poets and philosophers (those who are seen as rebels), have been nudged aside. But that's the way it's always been too. Bush though would have made a poor Medici. They at least knew who to hire though, if you have been to Florence, you know they didn't always have good taste either. administration brought us the apotheosis of corporate greed, they feel no compuction against force. Which along with their lack of concern for the environment and the public good may be their worst crime. Their easy reliance on war. I recently read something by by Eric Fonner, the American Civil War historian, and without mentioning who he said that he had once believed Andrew Johnson was our worst president. No more. Sometimes less is indeed more. Leaving that blank was such a tantalizing incrimination on our current administration. Vax. What about the slavery issue? That didn't lurk deeply somewhere among Lincoln's, the South's, and the Northern Abolitionists' concerns? Considering how that war got beneath Lincoln's skin and became a transcendent issue, so that he redefined the American union, modernizing it, so to speak, with ideals we admire and define ourselves with today ("government of the people, by the people, and for the people") suspending habeas corpus seems a small thing. Nor, judging from the transcendence of his speeches, did personal power (its desire and possession) ever corrupt his ambitions. Words of the sort found in the Second Inaugural do not come to empty fakes. And I think it is safe to say Lincoln's humanity was also very great. Anyway, Lincoln had genius in both politics and in philosophy and literature. And that ain't no small thing. The new CD, entitled Shine, came out in late September, and obviously I've taken my time getting to it. Ultimately my daughter, who's 16, asked Where is it, Dad? I guess I didn't have the eagerness I sometimes get to go for it before any reviews are out. I had heard her a couple years ago, and she sounded so husky I feared a little we might be headed toward a Billie Holiday repeat. I knew the ballet was involved in this project too, so I wondered whether there'd be a DVD---but the fact is I just didn't pursue it. Often I feel if something's truly sensational, I'll hear about it...even stuck out here in the sticks as I am. But Ilona's question got me moving and I went after some reviews. Hmmm, mixed, lukewarm, disappointed, concerns over the Starbucks connection. Amazon was offering a special deal (still is) of Shine plus Herbie Hancock's tribute to Joni, entitled The River. The lineup with Hancock looked stupendous...including Joni herself. I ordered it---and, Amazon being Amazon, it arrived almost as soon as I'd finished brewing a cup of coffee. Let me say upfront I like both albums very much. As far as I'm concerned Joni sounds great---not really husky at all, but with a somewhat deeper range...down into Diana Kral territory, which just might shake up that lady a bit. Her voice has an edge to it now, which we jazz fans might characterize as "swinging." We all know she started moving into jazz territory some 30 years ago, and almost everybody gritted their teeth and maybe most bid her farewell. The songs that followed often were insolent, deeper, even profound---songs we're still just catching up with. But jazz chops she did not have...and the audience dwindled. Then 10 years ago, she said Forget it, I'm not doing it anymore---and except for an occasional project that didn't involve new composition, she retired to her house by the sea. Whether she was woodshedding out there I don't know, but man the woman is ready. She's worked with wunderkind jazz drummer Brian Blade now for some time, and he may have helped her sharpen her time. She still can bring back the willowy, waving dreamer girl when she needs to, but the melancholy has darkened with age and her upset with governments is seething with sardonic anger. "Shine on the Catholic Church, and the prisons that it owns. Shine on all the churches: They all love less and less." The Hancock album apparently has 10 cuts, but Amazon claims that its offering somehow carries 12. It's true that it does, and if it's the only place to get it that way, maybe you should, because the extra 2 are really good...especially his lovely and simple treatment of A Case Of You. Seven of the 12 have vocals, all by different people. Joni brings a new version of Tea Leaf Prophecy that I much prefer to the original. Norah Jones attempts Court And Spark, but here's another lady who might do well to develop some of that edgy swing. Tina Turner's here and sounds sensational---with a nice wah-wah guitar backing that takes me back to Motown. Luciana Souza is subdued and appropriately shattered in her treatment of Amelia. The standout however is Leonard Cohen, who recites Joni's Jungle Line rather than attempting to sing it. Hancock (I just can't call him "Herbie" anymore) improvises behind or underneath or something, and while I'm not a poetry & jazz kind of guy this performance is positively brilliant. So the weekend has been all about Joni---when we weren't doing mucho chores---and I'm glowing from it. Of course last night, Amelia ringing in our ears, we had to get out the DVD of Shadows And Light and see the whole thing---with of course the epiphany being Pat Matheny's genius cadenza, with Lyle Mays providing pillows for his Pat's every leap, followed by Hejira with video of Joni flying across ice on skates. If you've never seen anything from that tour of nearly 30 years ago, do seek it out. Jaco Pastorius on bass and the late Michael Brecker, who just achieved Down Beat Hall of Fame stature, on tenor and soprano. And it's a good chance to see what a stupefying guitar player Joni is. Duke Ellington used to compliment special people by saying they were "beyond category." I can't think of anybody more deserving of that kind of praise than this lady. Joni's website has every review they can find...including the bad ones, like Christgau's scathing summary for Rolling Stone. 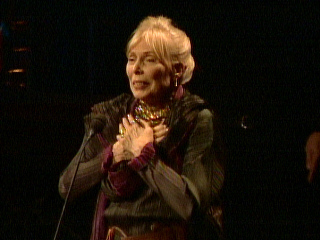 http://jonimitchell.com/musician/album.cfm?id=28 I found of special value the one from Associated Press http://jonimitchell.com/library/view.cfm?id=1768 and an interview with Joni in which she discusses each new song http://jonimitchell.com/library/view.cfm?id=1666 . Amazon's page for the Hancock is here http://www.amazon.com/River-Letters-Tracks-Amazon-com-Exclusive/dp/B000V9RRPQ .